I cry for my second home “namida ga afuremasu….” I really can’t believe it. The earthquake is devastating enough but the tsunami and now possibly the power plants is beyond comprehension. I was in Maui when I heard the news…as the tsunami struck Sendai, tsunami warnings started going off across the Pacific- including Maui. I thought of the fact that on any normal week I would be in Japan and I felt the fear of all of those who I love on those suddenly vulnerable islands so far away. I am blessed to know my friends and yoga kula are all safe but there are so many who are lost that it is a quiet celebration. As we watched the news clips on the laptop the young girls in the home where I am staying asked ” Is God mad at Japan?” As I watched the clips I thought that nature does not pick a country or a person- the earth decides to shake and the water is pushed into movement and where it chooses to go is just nature- it does not pick and choose. I told the girls that what God wants us to know out of this act of nature is that we need to care about each other, take care of each other… love each other. As the world shrinks from technology it should never desensitize us to the fact that we are all here together- manifested forms of one consciousness that needs reminding that we are all connected. I thought of the beautiful story of the Kannon, or Guan Yin. The Kannon struggled so hard to see all those that were suffering that her head split in half. 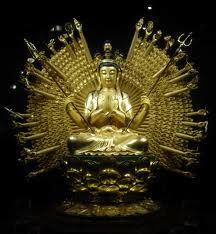 The Amidha Buddha blessed her with eight heads to see better those she wanted to help. Out of her expanded vision she reached her two arms with compassion to end suffering and they split into two. 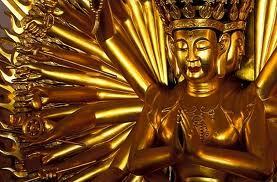 Once again the Amida buddha took pity on her and grew her a thousand arms to better offer compassion. My friend Eiko kept saying to me that she could feel a change this year, “tenki” in Japanese,…a turning point. She is so very wise and so very right. There has been a change this year in my teaching, my home life, my deep vision of life. I can’t tell what did it or when it was exactly; but it happened. I now sit in a much deeper seat of sorts and I watch the play of the divine energy of life, the shakti, in a whole new way. My lack of writing comes from a new offering of my time to yoga therapy. I am in the physio clinic once a week but a whole new group of privates has sprung from that seed and writing has become a luxury. Today I write to you all from- surprise!- Maui. Yes back again to observe and assist an Immersion 3 with Sundari and Skeeter. I hope that by watching these two brilliant souls approach the material I will gain an insight into how I might one day teach an Immersion. The certification process is still on going for me, but I feel I am growing and going deeper in all the right ways. In the last few months I have spent time with my mentor teacher Robin Golt and her level of wisdom is so deeply humbling. I look to her , and some other teachers I admire very much, and i noticed that many of them are students of Dr.Paul Muller Ortega’s and so, come fall, I will meet and study with Paul. I had put off this type of deepening of the nonphysical parts of practice until certification was over but really…what am I waiting for? We all seem to need signs…I figure signs are there for those of us too thick headed to hear Shakti calling us….”huh? me? oh ME?? ?” Yes- it sometimes takes me a while to get the message. So I am getting better at listening and in that there is an unfolding, a profound deep wisdom that unfurls in your heart- a flower waiting for the light of consciousness to shine on it. I AM THAT…..whoa..can I please go back to ignorance ?This whole new thing has such a weight of responsibility to it that you cannot ignore it…you can’t go back. You have hit a turning point and everything has shifted…are you ready for it? The practice of yoga can make us ready….. if we practice from the heart. There will be more turning points in my life , in all of our lives, because an upward spiral needs to turn to continue it’s climb. Like kundalini, the energy of shakti rising through us, we flow through the turns and move and dance our way back home…to our deepest, best selves.